Detail of Hibbart’s map of 1786. Reproduced by kind permission of Bath Record Office. 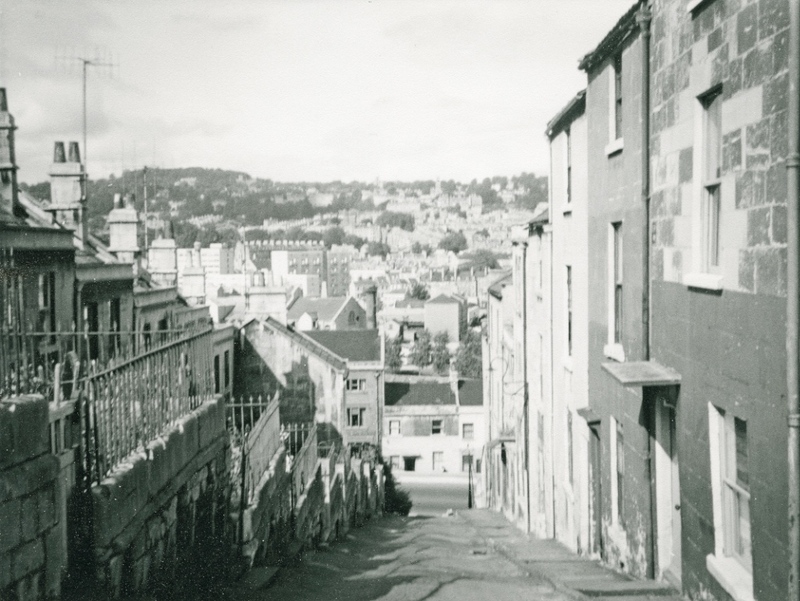 Wells Road was constructed in the 1770s in order to provide a gentler gradient than steep Holloway for traffic between Bath city centre and the Holloway turnpike at Bear Flat to the south. The map below outlines a scheme in the 1820s which would have changed the area considerably. It aimed to prevent severe flooding by straightening the course of the Avon and extending the junction with the canal west of the town centre, but the scheme was not pursued. Detail from map of 1816. Reproduced by kind permission of Bath Record Office. Development between Lower Bristol Road and Wells Road was curtailed soon after by the construction of Brunel’s GWR railway viaduct during the latter half of the 1830s, the line to Bristol being opened in August 1840. Detail from Godwin’s map of 1843. Reproduced by kind permission of Bath Record Office. The group of buildings on the north side of lower Wells Road, now mostly residential, were built during the 1830s. 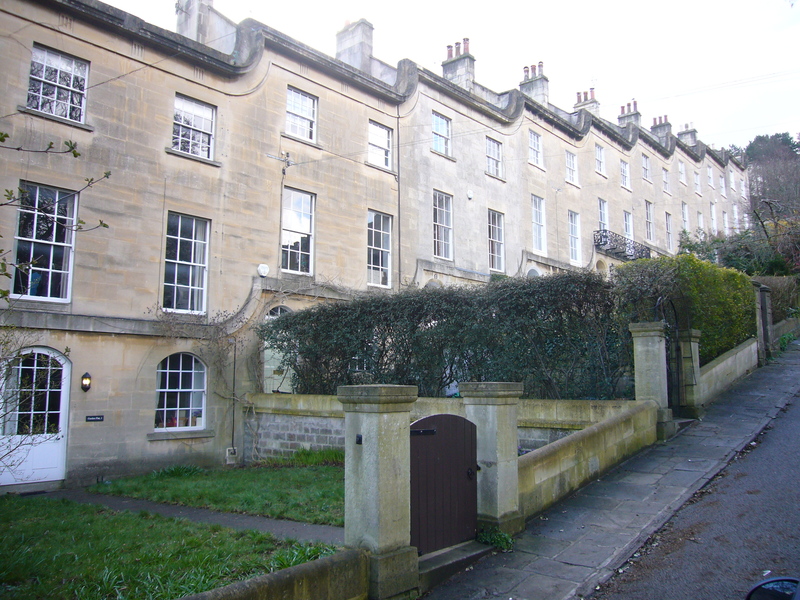 The small lower terrace was known as Angel Terrace and nos. 16-48 were named Prospect Buildings, originally a row of small shops and dwellings. Detail of the OS map of 1885 showing the lower Wells Road area. Courtesy Bath Record Office. Some rebuilding had to be done after the air raid damage in 1942. The flats at nos. 26-28 Wells Road used to be The Railway public house that closed in the 1990s due to falling trade. Formerly it had got much of its trade from people working at premises in the Lower Bristol Road who used the rear entrance to the pub for quick access. Paradise Street, built to the east side of St Mary’s Buildings, linked Old Orchard (now roughly where the Holloway cul de sac is) to Wells Road. In 1961 eight of the original twenty houses were occupied, but by 1971 this number had dropped to only two: demolition soon followed. View down Paradise Street to Wells Road in mid 1960s. Courtesy of Bath in Time. The most modern building in the area today is the steel-clad commercial unit that houses the Action on Hearing Loss workshop and gift shop, plus the ever-enticing Great Western Wine outlet. Today’s woodland scarp on the south side of lower Wells Road was created in the mid-1960s when Lisbon Terrace (bomb damaged), Paradise Place, Somerset Place and Warwick Place were demolished to accommodate the new route of Wells Road. Detail of bomb hits in 1942. Reproduced by kind permission of Bath Record Office. Red circle shows exploded bomb, Blue circle represents unexploded bomb. 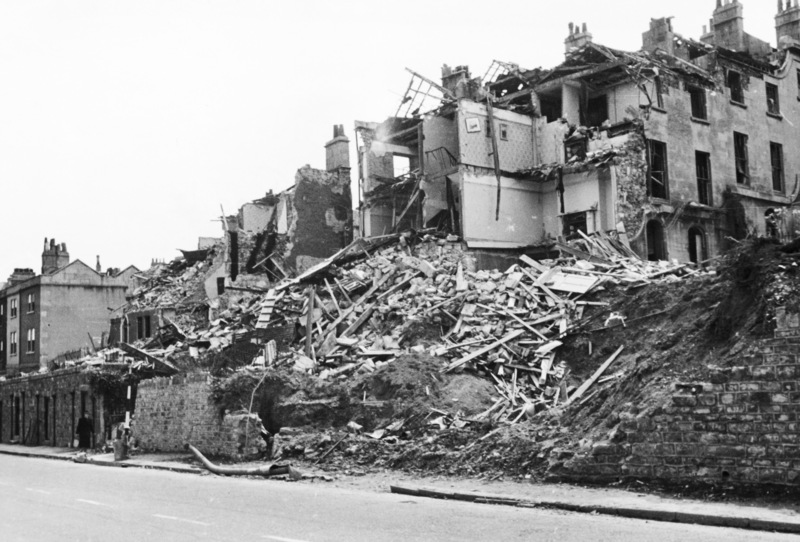 Bomb damage to St Mary’s Buildings & Lisbon Terrace in 1942. Courtesy of Bernard Thomason. St Mary’s Buildings, in a private road sheltered by trees from the busy Wells Road, were built in about 1820 and attributed by some to John Pinch. The nine houses form a delightful terrace with linked, sweeping cornices that complement the elegant proportions of this late-Georgian gem. At a casual glance it is difficult to see that houses 1 to 3 were rebuilt after major bomb damage in 1942. St Mary’s Buildings today; built ca 1820, attributed to John Pinch. The area between Holloway and Wells Road, comprising Park Avenue, Magdalen Road and Magdalen Avenue, was developed in the early 1900s, as were the terraced houses of 77 to 117 Wells Road. Holloway House was demolished to make way for access to the development off Holloway on land formerly belonging to the house extending down to Wells Road. One of the large stone entrance posts to Holloway House, now part of the Chapel garden wall, is all that remains. In 1972 the western extent of the Widcombe Parish boundary was revised when St Mark’s Church was closed. Today the boundary runs to the immediate west of numbers 9 and 30 Park Avenue, numbers 21 and 22 Magdalen Avenue and number 117 Wells Road, whence it runs in a straight line due north to the south bank of the Avon.